2. In order to meet the different needs of customers, this link only sale a writing tablet and a pen, not include other accessories such as cover, extra pen and magnet. The product ID of accessories is 1128468 and 1132024. Sealed 3V watch battery (replaceable) provides over 50,000 erase cycles. Erase your image with the touch of a button at a second and a friendly flash from the liquid crystal display. 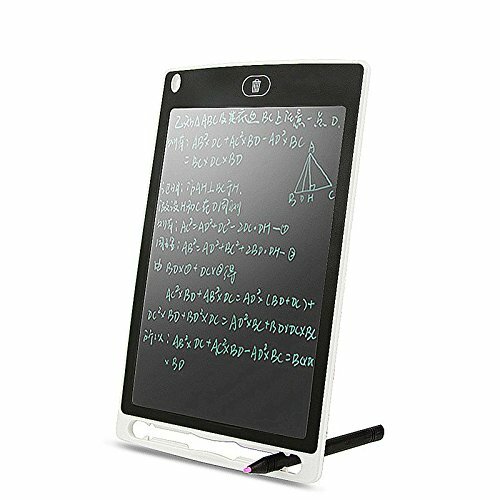 Large writing surface with 8.5 inch LCD screen gives you even more room to draw or write to show your imagination or education content. Let imaginations run wild without worrying about the mess from markers. The case and LCD screen are made from durable, shatter-proof, non-toxic plastic materials. Get one for on the go, in the office, class, business meeting, presentation or to-do-list, hospital, school and multiple places around the house. Almost anywhere you'd keep memo pads, sticky notes or scrap paper. If you have any questions about this product by SENREAL, contact us by completing and submitting the form below. If you are looking for a specif part number, please include it with your message.